Kindred, by Octavia E. Butler, is my “Feminist sci-fi novel” selection for my 2017 Reading Challenge. 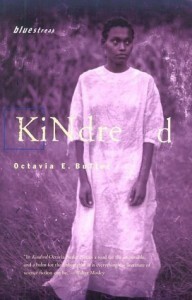 Kindred is an amazing story about a modern black woman, circa 1976, who suddenly and repeatedly finds herself transported to antebellum Maryland whenever her white, slave-owning ancestor's life needs saving. Butler does an amazing job of bringing this time to life, and the characters are complex and real when they easily could have become caricatures. Butler is a master who handles this story with great skill. Despite that, I can't say it's an enjoyable read, but I think maybe it's an important one. There are a lot of hard scenes – hard truths – in here, and it's disturbing to see how easily people can justify horrendous treatment of other human beings, even if they're supposedly decent or fair people. The struggles of a contemporary black woman dealing with such an earth-altering shift were very believable. Some portions may be uncomfortable, but it's definitely compelling. As a huge sci-fi/spec fic fan, I have no problem with some of the open-endedness of the book, though it seems some others do. I don't need to know why she starts time travelling; it's the premise of the book. I do wish some of my questions had been answered, which I won't get into due to spoilers, but our heroine doesn't know the answer to these questions either, so it's fairly portrayed. I think the book is designed to bring up questions and make us think. It does an admirable job without being a gimmick, imo. I'd definitely recommend the book, but be aware that it covers some dark material. I'll definitely check it out. Bring descended from slaves and slave owners myself I feel it's always good to try to read about that time period and see what people were going through back then and contrast it to things that are happening today. Also the fact that it's sci-fi will bring another dimension of interest to the story for me. With the main character being transported backwards in time and what not. I like the way the time travel was done in this one. That's awesome that you know about your heritage. I'm wanting to get started in genealogy and learn more about mine.